There is nothing quite like riding the train at magic hour, into the City of Dreaming Spires. I spent much of the day in London, including several important hours catching up with an old friend, having a fantastic brunch at The Breakfast Club in Soho, and walking through Hyde Park during the sunny, warm afternoon. As the day dwindled toward evening I walked from Warwick Avenue to Paddington Station, past canal boats floating low in the water covered in bright, chipping paint and overgrown planter boxes of flowers. The departing sun set the sky alight in lavender, periwinkle, rose and indigo while the train sped toward Oxford. I chose to walk the mile and a half from the station to my lodgings in a friend’s college rooms so I could take in the city along the way. 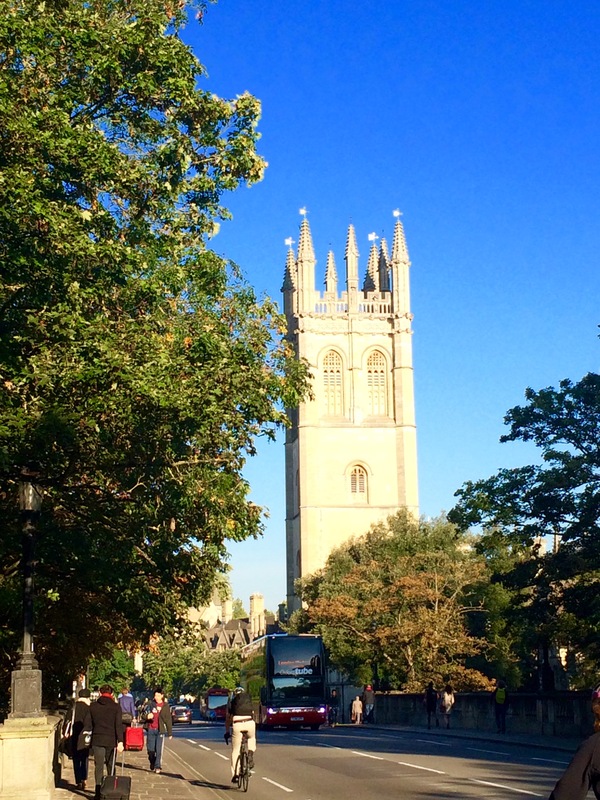 Sure enough I passed beneath the lit steeple of the University Church of St. Mary the Virgin, and not long after the tower at Magdalen College, where C.S. Lewis spent much of his teaching career. Crossing the bridge over the River Cherwell I could look back and see clearly why Oxford has been called the City of Dreaming Spires: the old college buildings send up spire after stone spire into the starry night air. I arrived into my rooms which were warm and welcoming, filled with familiar books, including a shrine with Jung’s Red Book upon it. I found it somewhat amazing (although not surprising once I reflected on whose room I was occupying and our similar academic interests) that I had come halfway around the planet to study Tolkien’s visionary artwork, the contents of his Red Book, in the Bodleian Library, and right in my bedroom would be an accessible copy of the other Red Book to which I am comparing the results. It felt like an affirmation I was in the right place. Early the following morning I awoke, soon to realize I was shaking—with anticipation, nerves, excitement, I wasn’t entirely sure. 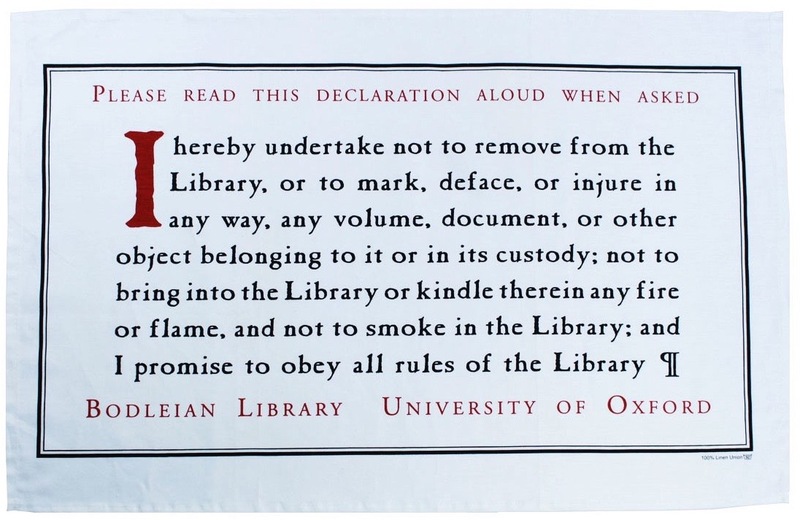 I planned to arrive at Admissions in the Bodleian at 9:00 am as they opened, and hopefully if all went well in getting my reader’s card I’d be meeting with the head archivist of the Tolkien special collection by 9:30. 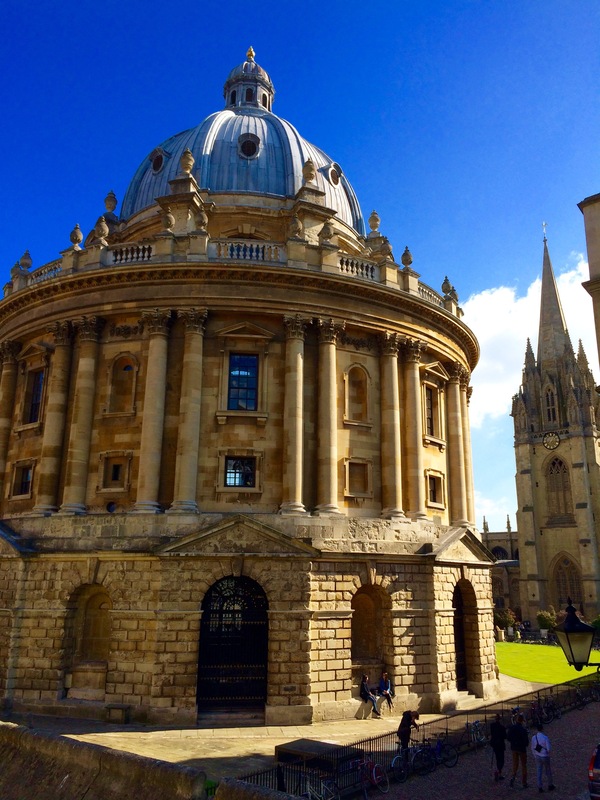 Walking through the streets of Oxford, down Queen’s Lane and under Oxford’s own Bridge of Sighs toward the library, I felt a deep sense of connection to this place. Ten years ago I once had the dream of attending this university, and now again that desire was reawakened. I could feel the past presence of those literary figures who had shaped me in such a formative way. Something in the heart of Oxford was calling to me once more. Then to the lockers where I left all my belongings except a pencil and blank sheets of paper, through the secure entryway, up the stairs and into the reading room. 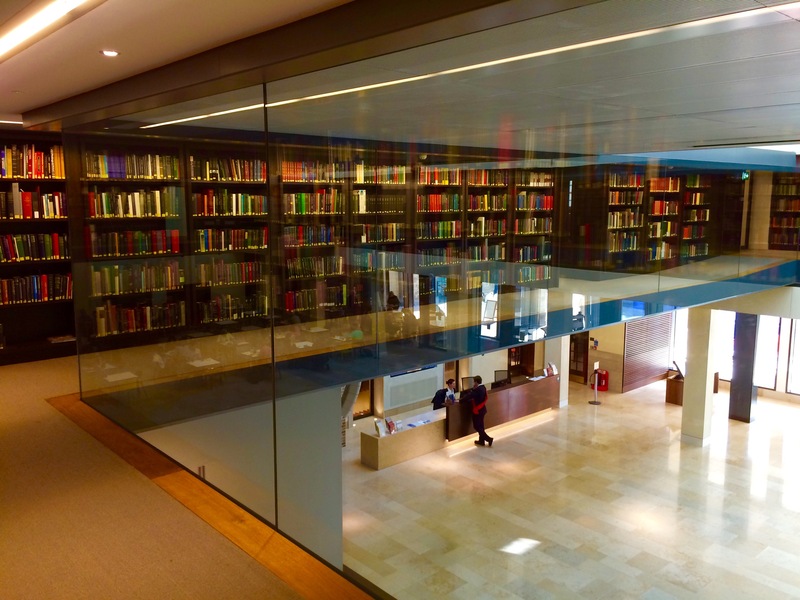 There I was met by the Tolkien archivist, a wonderful woman who has what I felt to be one of the most admirable and enviable positions in the library. We spoke for a little while about my research goals and then she set me up at a table with the first of four boxes of Tolkien’s artwork that I would be studying over this morning and the following. My hands shook a little as I opened the first box, but I soon relaxed into the process, turning from one drawing to the next. What did I find there? Well, I’ve signed too many forms to risk revealing much here without the permission of the Tolkien Trust. But I’ll just simply say that I believe I found what I came for, that my thinking in these areas has been affirmed, and perhaps someday I will be able to express the fullness of what I saw in my dissertation. Much of Tolkien’s great art has been published already, for which I am immensely grateful. But a few pieces remain hidden which would be wonderful if they could be seen by the wider world. And the sequence itself of the artwork has its own story to tell. After several hours and even more pages of notes I decided it was time for a change of scene, so I packed up and departed the library. I made a brief stop in Blackwell’s Bookshop, my favorite book store in the world that I hadn’t been inside of for about five years. 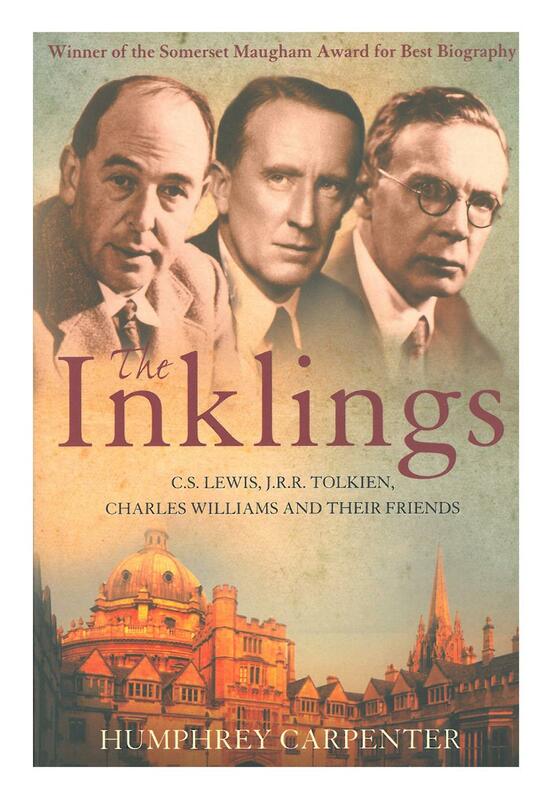 Of course they had a whole Inklings section right up at the front, and I was able to get a copy of Verlyn Flieger’s edited edition of Tolkien’s fantastic essay “On Fairy-Stories,” first given in 1939 as the Andrew Lang lectures at the University of St. Andrews in Scotland. They also had lovely little editions of several of Tolkien’s short stories; I limited myself to two: Smith of Wootton Major and The Adventures of Tom Bombadil and Other Verses from the Red Book, each with accompanying introductory and critical essays. 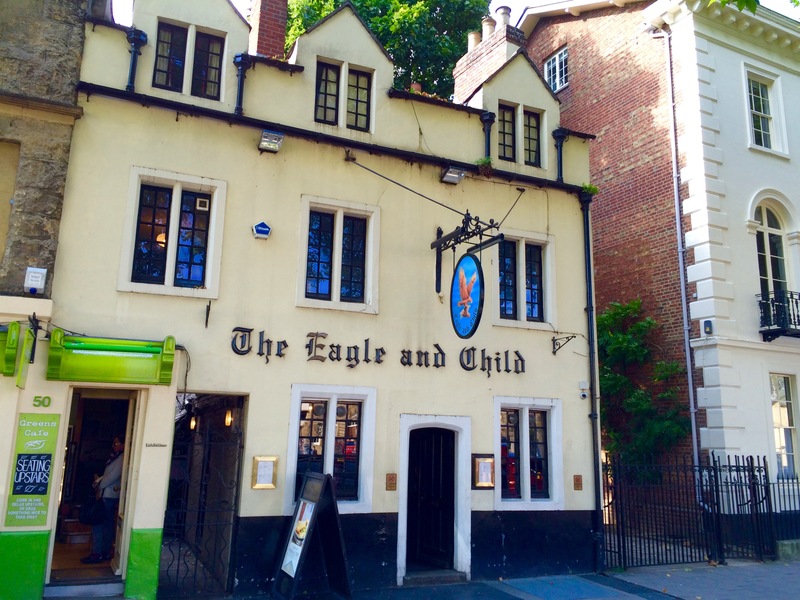 Lunch at the Eagle and Child pub seemed the only appropriate place to go next, so I walked up St. Giles to the legendary “Bird and Baby,” and was soon sitting in the back room with a pint and vegetable pie, gazing at oil portraits of Tolkien and Lewis and scribbling notes on my morning’s research. That afternoon I met up with a family friend who happens to be teaching in Oxford for the next two months, so we spent the next several hours catching up and discussing ideas on an array of topics, from philosophy and religion, to literature and travel. We walked home through Oxford in the evening together, conversation still well underway. Morning found me once again in the Sir Charles Mackerras Reading Room, pouring over more drawings. But finally the time came for me to depart and I left with reluctance. Would I have the opportunity to again be a researcher in these halls? I hope my life may take such a turn. For the afternoon I had a special pilgrimage planned: a long walk from Oxford city center first to 20 Northmoor Road, where Tolkien and his family lived seventeen years, and then on a few more miles up to the Wolvercote Cemetery where Tolkien and his wife Edith are buried beneath one gravestone. It felt important to me to walk, to really put in the time and effort and make it to each place on foot. I tried to imagine what it might have been like to live here, raising four children, preparing lectures, marking exams, and writing thousands upon thousands of pages of fantasy and Elvish lexicons during some of the spare hours in between. I peered at the smaller house next door, number 22, where the Tolkiens had lived for a shorter period before, from 1926 to 1930. Eventually I continued on my way, grateful to have glimpsed these two homes. The walk up to Wolvercote Cemetary was actually much longer than I expected, and a few times I thought I might be lost. I started to worry I wasn’t going in the right direction, or worse yet that I was but had somehow mistaken the cemetery and was walking far out of my way for nothing. I departed the road I had been on, thinking perhaps the cemetery was further east. I began to walk down an unfamiliar road when suddenly I had a strong sense to turn around. I did, and following intuition more than anything else I realized I was now on Banbury Road, the very road the cemetery was meant to be on. Sure enough just several hundred feet further, and a little sign pointed me into a wide, grassy cemetery. 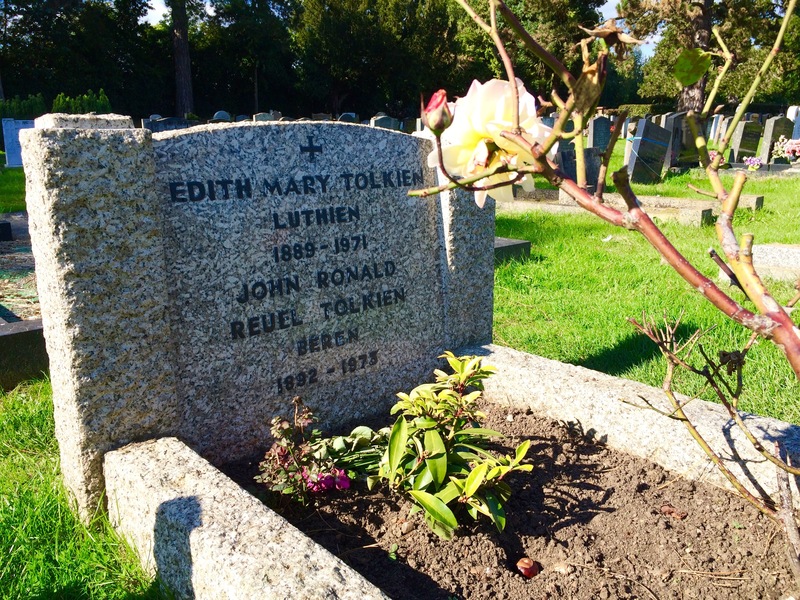 A brass plaque indicated to follow the signs to Tolkien’s grave. I had made it. I cannot recount here all the emotions that arose in me at the sight of this grave. I’ll simply say it was a deeply meaningful experience, far more than I was even expecting. I spent a long time there. At one moment a strong wind picked up, shaking the trees. I was reminded of when the wind blew through the trees as Tolkien and Lewis were on Addison’s Walk by Magdalen College, the night that Lewis had his conversion experience, which Tolkien commemorated in his poem “Mythopoeia.” Finally I felt it was time to depart. As I turned away I saw a small, pure white feather on the ground. Rarely do I collect tokens of remembrance, but this time I felt the feather was for me. It was a joy to rest my feet as I sat on the upper deck of the bus back toward city center, right at the front window so I could see clearly the whole return journey. I felt in a place of great peace. 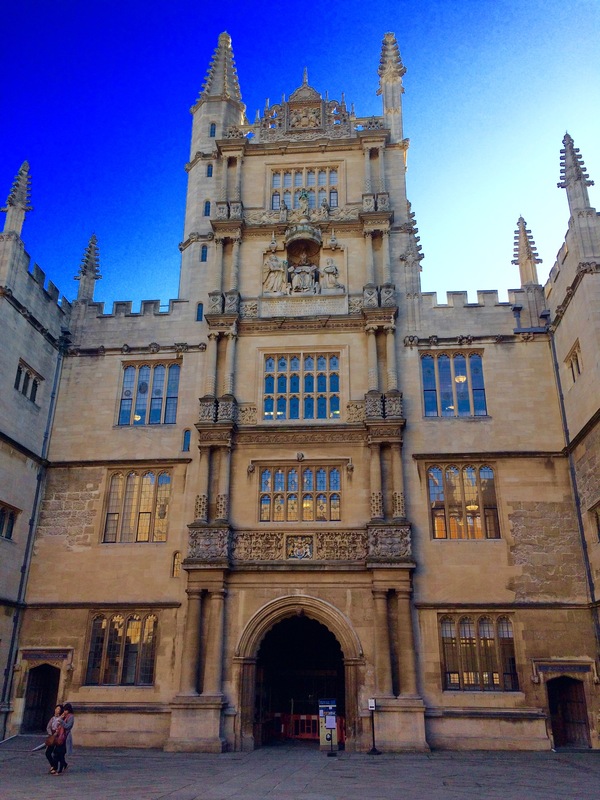 Arriving back into the heart of Oxford, I walked over to Exeter College, where Tolkien studied as an undergraduate, and was able to enter with my newly acquired reader’s card. (“I’m a visiting researcher, may I enter the college?”) Passing the emerald green quad I entered first the chapel, where a tapestry of the Adoration of the Magi adorned the front left-hand wall. A copper bust of Tolkien stood near the back, not too far from the door. Although small, Exeter’s chapel is exquisite. From there I somehow found myself in the Fellows’ Garden, a peaceful lawn bathed in sunlight, trees and flowers scattered throughout, a large fig climbing the stone wall by the private college library. Toward the back right of the garden is a small pond filled with water lilies, and a stone staircase ascending the outer wall of the college. Coming to the top of the stairs I found myself with a spectacular view looking out toward the round Radcliffe Camera, the tower of the University Church just beyond it. Below me a crowd of tourists happened to be walking by, but up here on the wall of Exeter College I was secluded, in the peace of an idyllic garden where generations have come to study outside. 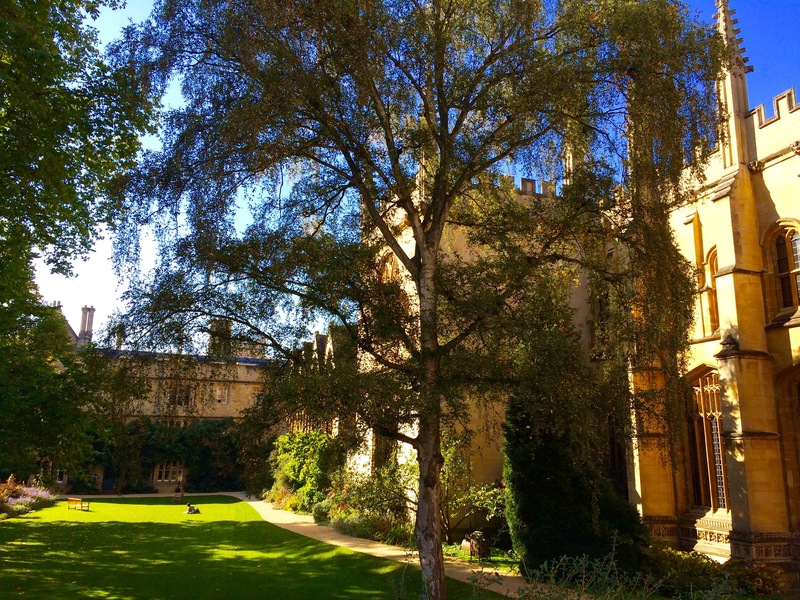 After Exeter I went on to visit two more colleges: Christ Church College, which is by far the largest and wealthiest, with vast meadows stretching beyond it, and Magdalen, where C.S. Lewis was situated. Walking down the echoing corridor beside the Magdalen quad I had an internal image of black-robed students walking down these same halls, when suddenly I turned a corner and a whole choir of schoolboys in the very black robes I had been imagining processed down the passageway before me, turning quickly (and the smallest ones in the back shoving each other) into an arched doorway to the left. My footsteps carried me further until I passed out of the wrought-iron gates and across the small bridge over the River Cherwell onto the pathway of Addison’s Walk. Turning left I walked for a ways beside the river, stopping when I came to the next bridge and seeing to my right in the meadow a large herd of deer. All of the females and fawns were standing eating grass, while the two males with antlers—one significantly larger and presumably older than the other—sat on the ground on either side of the herd. After a moment in quiet reflection beside the deer, I turned back the way I’d come. I noticed a few things I had missed on the way in: a few large stumps that had been carved into thrones rooted directly into the ground, and a small moored boat that looked like it must belong to Ratty from Wind in the Willows. By now completely exhausted from all my walking, I returned to the University Church which had a garden café at the bottom, and sat with a perfect cup of English tea and a scone, replete with clotted cream and strawberry jam. Just refreshed, I went to meet the same family friend I had joined the afternoon prior and we walked together over to Christ Church chapel to attend Evensong. It’s one thing to tiptoe into the college chapels when no one is there and take in the art and carvings on the walls, it’s another to come in when candles are lit and the air vibrates with the voices of young men and boys in the choir. Thus, after a beautiful dinner and evening, my time in Oxford was coming to a close. The following morning I packed everything up and walked back toward the train station the same way I had walked in. An autumn mist had descended on the city, turning the morning Sun’s light into diffused rays that scattered across the yellow stones and fading trees. I felt a reluctance to leave this place. 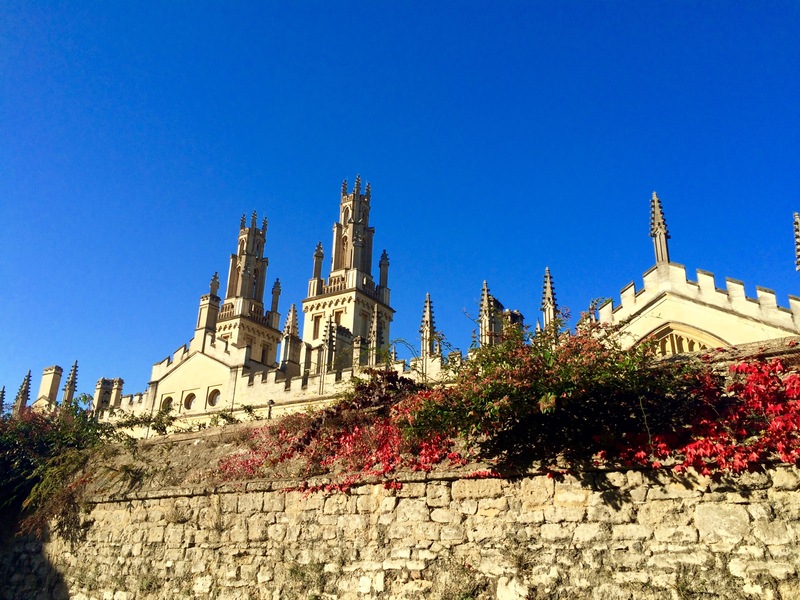 But if I am meant to return to the dreaming spires at some point in the future then I must trust that I will. Many critics have said that C.S. 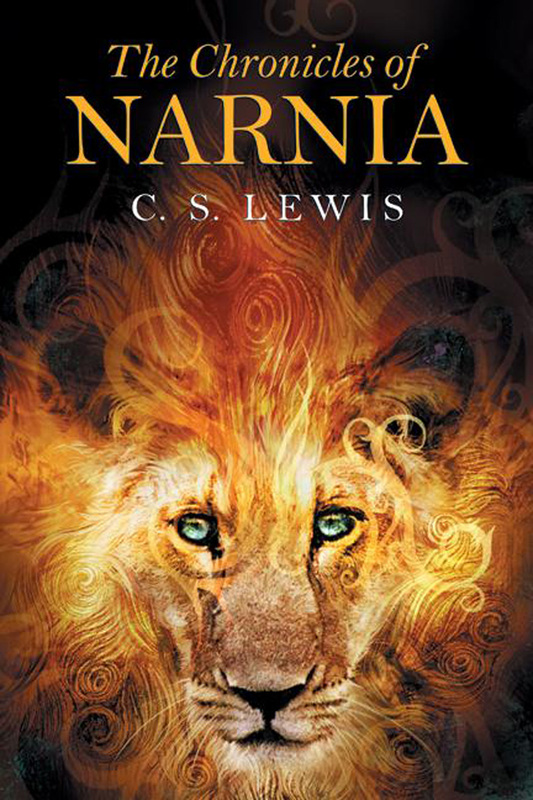 Lewis’s Chronicles of Narnia seem to possess “little apparent coherence in design,” no clear continuity of tone or characters, or even consistent level of Christian allegory. Yet somehow these seven stories, penned “by an unlikely novice,” have gone on to “become some of the best-selling and most influential fables in the world.” In a book that started out as his doctoral dissertation, Michael Ward lays out what he believes is the underlying scheme present in The Chronicles: each of the seven short novels is an homage to one of the seven planets of the ancient cosmos, expressed through the atmosphere and tone of each book. Not only does this provide an account for the great variations between each of the stories, it also offers a much greater depth of insight to The Chronicles as a whole, and also to the author who dreamt them into being. Upon completing this book, I was entirely convinced by Ward’s argument, and as someone who seeks to keep my own archetypal eye open to the astrological manifestations in our world, I could clearly see how each of Lewis’s books expressed the planetary aura in a subtle and implicit way. As Ward writes, this aura or atmosphere must “remain hidden, woven into the warp and woof of the story so that it comprises not an object for Contemplation but the whole field of vision within which the story is experienced.” Ward’s methods for understanding the characteristics of each planet, as far as I could tell, were based entirely upon Lewis’s own expression of the planetary qualities in his other works, from his literary scholarship, to his Ransom Trilogy comprised of Out of the Silent Planet, Perelandra, and That Hideous Strength, to his poetry—particularly the poem entitled “The Planets,” which Ward was reading when the insight came to him about the underlying theme of The Chronicles. Ward did not draw on medieval sources of astrology, nor any contemporary works. Thus Ward’s depiction of the planetary archetypes was entirely through Lewis’s own perspective on them, which led to some interesting archetypal combinations that I will explore forthwith. Not only do each of The Chronicles of Narnia appear to subtly correlate to each of the ancient planets, as Lewis understood them from his breadth of knowledge about Medieval and Renaissance literature, but the expression of those planets is characterized by how they are each aspected in Lewis’s birth chart, which includes the archetypes of the three outer planets, Uranus, Neptune, and Pluto. 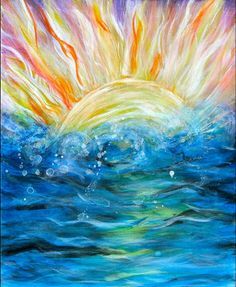 [Lewis] tells us that the waves break “for ever and ever,” as if they belong to an eternal realm; and this is indeed what he is wanting to evoke, what the whole book has been intended to evoke: a glimpse of supernatural reality, a window onto an aspect of the divine nature. We see Lewis’s Jupiter-Neptune expressed here in the depiction of an eternal realm, the supernatural reality, and the divine nature, all within the Jupiterian context of the novel that Ward has already laid forth. Interestingly, in the summer of 1948 when Lewis began to write The Lion, the Witch, and the Wardrobe, he happened to be undergoing a long transit of Jupiter conjoining his natal Mercury—perfect for writing a novel with a strong Jupiterian theme. The second book written in the series, Prince Caspian, is an expression of the planet Mars, run through with martial themes of war and violence. The entire story centers on the War of Deliverance that liberates Narnia from the tyrannical rule of the usurper King Miraz, with the Old Narnians and Prince Caspian aided by the four Pevensie children who first appeared in The Lion, the Witch, and the Wardrobe. Yet many of the themes Ward draws forward that illustrate the Martian atmosphere of the story actually have a more complex Mars-Saturn quality: discipline and obedience in the chain of military command, the necessity of war, steadfast strength in battle, the integrity of the true warrior. And it naturally follows to mention that C.S. Lewis is born with Mars trine Saturn in his natal chart. As Ward concludes the chapter on Mars he writes the primary themes present in Prince Caspian: “Discipline—obedience—faithfulness—strength—growth.” All of these qualities are manifestations of the planetary archetype of Saturn, but they are expressed through the Martian realm of the warrior in battle as portrayed in Prince Caspian. 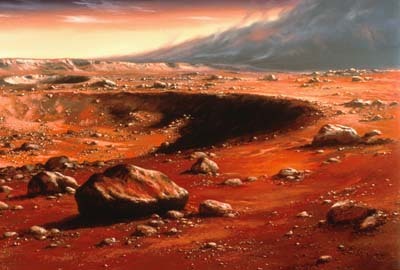 Thus, while the book is indeed an homage to Mars, it is Mars as seen through Lewis’s own Mars-Saturn complex. The Voyage of the Dawn Treader is clearly an expression of the Solar journey, as the heroes embark upon a sea voyage into the utter East, the land of the rising Sun. 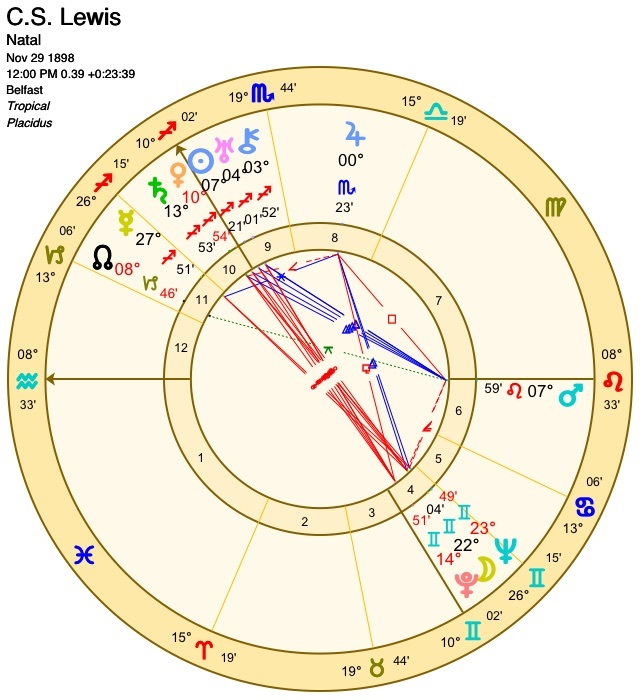 However, while much of the imagery in the tale is actually Neptunian—the atmosphere of the eternal ocean, the spiritual quest—many of the episodes within the story are Plutonic, which resonates with Lewis’s natal Sun-Pluto opposition (he does also have a very wide Sun-Neptune opposition). Much of the Solar imagery is alchemical, focusing on the transmutational and transformative power of the Solar gold. Ward writes about the “connection in [Lewis’s] imagination between Solar influence (improperly received) and the will to power;” the will to power is a clear manifestation of Pluto. Much of the story is about the transformation of one’s personal greed, ambition, and desire for power, all qualities associated with Pluto, into service for a higher good. Furthermore, a central piece of the story is Eustace’s journey of being turned into a dragon—an expression of the Plutonic underworld demon—and being transformed into a better person for the experience. The Solar ego with which Eustace enters the story constellates the Plutonic dragon energy within himself, transforming his very being into a monster, and when he is reborn from the discarded scales of the dragon, like a snake shedding its skin, he is reborn as a new Solar hero, humble and able to be in service to the whole. The Moon is the underlying theme of The Silver Chair, yet much of the imagery present in the story has little in common with an archetypal understanding of the Moon as an expression of emotion, feeling, caretaking, relationality, family, and nourishment. Indeed, the story is far more expressive of the two planets Lewis has in conjunction with the Moon: Neptune and Pluto. The story is darker than the previous three, and much of it is set in a dangerous land inhabited by vicious giants, and in Underland, the underworld realm of the witch reborn. 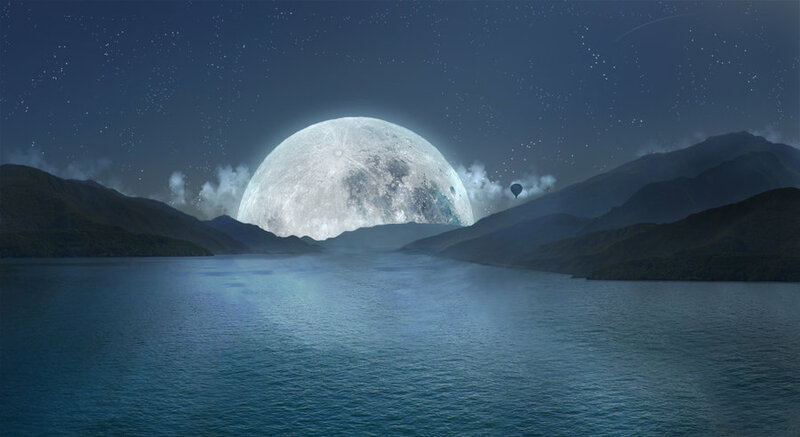 The Neptunian theme is also carried throughout in the form of water and wetness, from rain and fog, to marshes, tears, and an underground lake. Prince Rilian, who the heroes are attempting to rescue, is under an evil (Pluto) enchantment (Neptune) cast by the vile (Pluto) sorcery (Neptune) of the witch-queen, who transforms (Pluto) into a giant, terrifying serpent (Pluto) through her magical (Neptune) powers (Pluto). Most of the Lunar imagery is distorted through the Plutonic lens with which Lewis perceived it, and Ward spends much of the chapter on The Silver Chair defining the Moon by its relational submission to the Sun—a repression of the Lunar that is not only evident in Lewis’s chart but in the patriarchal culture that shaped his views, a culture that has elevated the Solar at the expense of the denied and relegated Lunar. Interestingly, one way in which the Lunar is able to shine through in this story is when the young girl Jill asks if she may return home at the end of the narrative, the only character to make such a request in the entirety of the Narniad. Lewis’s own struggle integrating the Lunar archetype in his life is clearly present in its expression in The Silver Chair. Mercury, particularly in the form of Gemini (which is ruled by Mercury), is the god present in The Horse and His Boy. Ward shows this clearly in the multiplicity of twin imagery, and that the whole story orients around the delivering of a vital message. Yet Ward also points out that the ongoing patterning of the story is about two merging into one, whether it is the separated twins reconnecting, or the mistaken belief that the main characters were being chased by two lions when really it was but one. 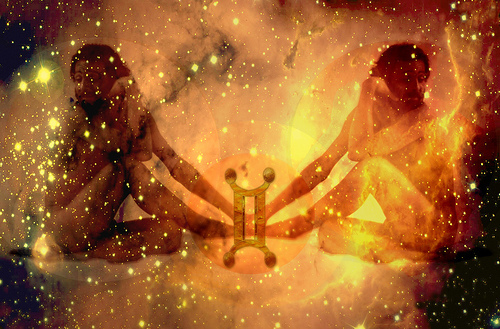 This theme of merging within the Mercurial context can be seen in Lewis’s natal Mercury-Neptune opposition, as Neptune has the capacity to dissolve boundaries and to unite all things into oneness. Furthermore, the Mercury-Neptune theme can be seen in Shasta’s encounter with Aslan, who is named simply “the Voice” in the text—a clear expression of Mercury within the divine Neptunian context. Yet the Venusian imagery is complexified further in the character of Jadis, the beautiful yet terrible queen of the dying world of Charn, a world destroyed by her own hand, who becomes the first evil present in Narnia. Jadis is the witch we meet later in The Lion, the Witch, and the Wardrobe. Here one can witness Lewis’s Venus-Pluto opposition in the evil and destructive power (Pluto) of this beautiful queen (Venus). Ward brings up an issue in this chapter that shows the clear influence of patriarchy on Lewis’s creative imagination. Each story expresses the planetary archetype most clearly through the character of Aslan, so Ward asks why in The Magician’s Nephew, as an homage to Venus, Aslan is not portrayed as female. He is taking the gendered imagery of the planets as gods and goddesses in the Hellenic pantheon quite literally in this question, ignoring the fact that the archetypes all express themselves in male and female form through each one of us. Ward writes, “Lewis was of the belief that major imaginative difficulties arose when one attempted to depict God in feminine terms.” Besides the inherent sexism in this statement, an interesting point is being addressed: when the Divine is depicted as feminine, or as both masculine and feminine, the imaginative implications ripple through all levels of reality. Ward quotes Lewis as saying, “a child who had been taught to pray to a Mother in Heaven would have a religious life radically different from that of a Christian child.” I actually agree with this statement, but not in the way that Lewis meant it. What a different world we might live in if the feminine aspect of the Divine had been given equal devotion as the male, or if the female, male, and non-gendered aspects of each planetary archetype were given equal recognition. Ward concludes by saying that the feminine aspect of Venus is still expressed through Aslan, but not by changing the lion’s gender.
. . . Aslan is feminized, but not to the complete expulsion of the masculine. And this is a fair representation of Venus, for Venus may be properly understood as containing a masculine element alongside her feminine ones. If only Lewis, and Ward, could have seen the way each archetype contains feminine and masculine elements, as they both recognized in relation to Venus. The Narniad concludes with The Last Battle, a tragic homage to the final planet of the ancient cosmos, Saturn. 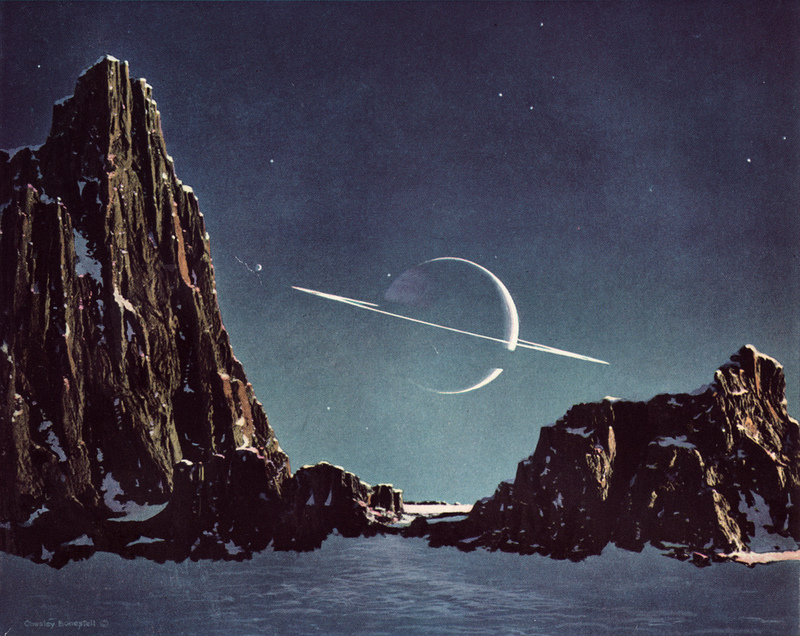 Lewis’s natal Saturn-Pluto opposition is deeply apparent in his depiction of Saturn’s domain. Ward writes that for Lewis “evil was perceived as a merciless power in his younger days; as weakness, sorrow, and death in his later years.” The Last Battle is indeed tragic and filled with death (Saturn) and the destructive (Pluto) ending (Saturn) of the Narnian world. “Under the planet who is responsible for ‘fatal accidents,’” Ward writes, “everyone who is alive at the beginning of this story is dead by the end of it.” Yet Lewis, and also Ward, seem unable to recognize the gifts and nobility of the Saturnian archetype, desiring rather to return to the Jupiterian themes that began The Chronicles of Narnia. This depiction of only the negative side of Saturn is also a reflection of how Saturn was understood by Medieval and Renaissance sources, which naturally shaped Lewis’s understanding of the archetype. The ending of The Last Battle begins to shift toward images of spring and rebirth, an awakening into a radically different world—the true Narnia where all the characters from previous ages are reborn and living in peace. Ward sees this as Saturn deferring to Jupiter, writing “the spirit of the sixth sphere [Jupiter] is also the spirit which dominates the universe beyond the seventh [Saturn].” He goes on to say later in the chapter, “Indeed, it is only by virtue of his deferral to Jove that Saturn can exert his true influence, making his patients into contemplatives who see beyond sorrow.” I would argue rather that this is not Saturn deferring to Jupiter, but rather Saturn being seen all the way through in the entirety of its archetypal spectrum, moving from sorrow and death to the contemplative wisdom granted by sitting with the inherent grief of such challenges and obstacles. Saturn’s medicine can be found still within the seventh sphere, without having to turn elsewhere for its gifts. Although The Chronicles of Narnia, from Ward’s perspective, are an expression of the ancient Ptolemaic cosmos, the archetypes of the three outer planets are still present implicitly throughout the series. This is most apparent at the end of The Last Battle when there are clear intimations that there is a world beyond the threshold of Saturn. Ward writes, “Sorrow comes, but it is not total, not ‘full,’ there is something ‘beyond;’ Saturn does not have the last word.” Indeed, Saturn does not have the last word, but not because there is a deferral to Jupiter; rather the threshold is at last crossed and we are able to enter the transpersonal realm of Uranus, Neptune, and Pluto. These three archetypes are all present and interwoven in the final pages of The Last Battle, as all of the characters enter into a radically new world, a true paradigm shift (Uranus) in a transcendent, heavenly, ideal realm (Neptune), because each character, indeed all of Narnia, has gone through a powerful cycle of death and rebirth (Pluto). To conclude, I would want to both critique and compliment Ward for the insight of the project he undertook, searching for a hidden underlying theme that unifies the entirety of Lewis’s Chronicles of Narnia. As I have hopefully made clear here, I feel he has really hit the mark with his analysis, perceiving the archetypal qualities of the ancient planets as expressed by each of the seven tales—although those archetypal qualities are complexified by their expression through the lens of Lewis’s own natal chart aspects. Yet my critique of Ward’s book is of the way in which he expressed his profound insight. For he opens the book by stating his assurance that the planetary theme was one clearly devised by Lewis but intentionally kept secret for the rest of his life. Before laying out any of his evidence Ward writes, “I believe that I also have discovered a genuine literary secret, one that has lain open to view since the Chronicles were first published, but that, remarkably, no-one has previously perceived.” His self-assurance, which echoes throughout the book, actually has the opposite effect upon the reader, casting into doubt his argument before the evidence has even been presented. Ward asserts again and again that the theme was intentionally created by Lewis and then kept as a guarded secret for decades. While it is clear from the evidence that The Chronicles do indeed express the planetary archetypes, I feel that the evidence would have stood more confidently on its own, without the investigations into Lewis’s reasons for keeping the theme a deeply hidden secret. The secrecy may indeed be so, but the pure literary evidence Ward puts forth actually speaks louder than his arguments—and there is a humility in the simple expression of the evidence when not overlaid by assertions of correct discovery. But perhaps that is my own stylistic preference. As can be seen in the above analysis, even if Lewis consciously chose to offer each one of The Chronicles to the altar of its own planetary god, the other gods are still intermingled throughout the novels. For even when we try to contain the gods in their archetypal purity, our own biased lenses, influenced by our particular birth charts, will naturally shape how the gods choose to express themselves. As was carved above the doorway of C.G. Jung’s home: “Vocatus atque non vocatus deus aderit.” Called or not called, the god is present. Ward, Michael. 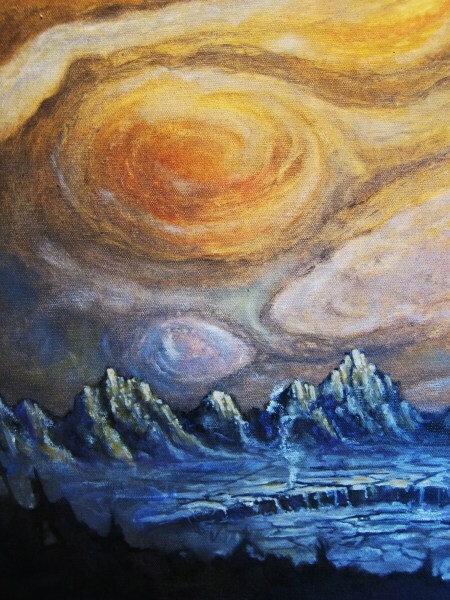 Planet Narnia: The Seven Heavens in the Imagination of C.S. Lewis. New York, NY: Oxford University Press, 2008. Michael Ward, Planet Narnia: The Seven Heavens in the Imagination of C.S. Lewis (New York, NY: Oxford University Press, 2008), 4. C.S. Lewis, qtd. in Ward, Planet Narnia, 184. The world of Narnia has a distinct aura, a tangible presence that remains evasive, elusive yet alluring. The feeling of the Narnian world is somehow familiar, eliciting that nostalgic pull that calls from the heart of the Imaginal Realm. Many years had passed since I last read C.S. Lewis’s series of seven short novels for children, and I returned to them with fresh eyes and a much wider perspective than my childhood consciousness brought to the stories. While still enchanted by the places, the names, the people of Narnia, I was also aware of the underlying Christian themes woven into the stories in a way I was not as a child. Recognizing these themes elicited a mixed reaction from me, for on the one hand I could appreciate what Lewis was trying to communicate, but on the other I have been so deeply influenced by J.R.R. Tolkien and his profound distaste for allegory that occasionally I wished the stories could stand for themselves, apart from any parallel meaning intended by the author. At times I felt I was losing the real experience of Narnia to the allegory behind it. The Chronicles of Narnia tell the full arc of the history of that realm, from its creation in The Magician’s Nephew and its parallels with Genesis, to The Last Battle, with its coming of the Antichrist and the Last Judgment, ending in the extinguishing of the world of Narnia. Yet each one also feels somewhat disparate from the others, in tone, style, and feeling. They almost seem to not quite hang together, while at the same time being compelling and hugely popular. My two favorite stories were The Lion, the Witch, and the Wardrobe and the Dawn Treader, interestingly perhaps the most and the least allegorical of the tales respectively. Although The Lion, the Witch, and the Wardrobe tells of the Crucifixion and the Resurrection, with Aslan the Lion representing Christ, that story also feels like the one in which the pure realm of Narnia, apart from any allegorical meaning, shines through most brightly. The world of Narnia has a life of its own in that tale, more exuberant than in any of the other stories, perhaps in part stemming from the fact it was the first book Lewis wrote in the series. The four Pevensie children, the frozen Lantern Waste, Mr. Tumnus the Faun, Aslan himself, all have an imaginal reality to them which stands above and beyond the allegory that later came to be told through their actions. The Christian allegories Lewis is telling are taking place in a genuine part of Faërie, to draw on Tolkien’s term for the Imaginal Realm. Indeed, these aspects of Narnia came to Lewis before the Christian themes worked themselves into the tales, and Aslan himself seemed to be appearing in Lewis’s dreams for some time before he began writing, as the Imaginal Realm can so often do when the veils between worlds begin to thin. The Voyage of the Dawn Treader, my second favorite of the novels, appears to be the least allegorical, intended to depict the spiritual life of those upon the journey to the World’s End. There is a numinosity to this story, and one feels saturated by the light of the East as the voyagers enter the sweet seas whose waters give strength and vitality. I felt a longing to enter into this depiction of Narnia more strongly than in all the other tales, as the Dawn Treader sails through the sea of white lilies toward Aslan’s country. Perhaps the magnetism of both The Lion and The Dawn Treader comes in particular from that tangible sense of Narnia as a real place, alluring one to enter into its landscapes. The Last Battle was difficult for me to read for many reasons, not least of which because of the judgments passed upon so many of the characters. When Aslan stands at the door of Narnia as the world is ending, in one moment all the creatures of that world are judged and divided. Those who glance upon him for even a moment without love in their eyes are cast aside; Talking Beasts become dumb and descend out of Aslan’s realm forever, to a place unbeknownst even to the author. Furthermore, all of the characters from our world who have played roles in the various stories are drawn together into the real Narnia, a place that is an allegory for Heaven, because in their own world they have all died in a sudden train accident—all except Susan, who was once a Queen of Narnia and who played a major role in both The Lion, the Witch, and the Wardrobe and in Prince Caspian. She has apparently dismissed her memories of Narnia as merely fantasy, games she played with her siblings as children. Yet at the end of The Lion, the Witch, and the Wardrobe Aslan says, “Once a king or queen in Narnia, always a king or queen.” Has he forgotten his own words? Is doubting one’s experiences so deep a sin that Susan is not only banned from ever entering the real Narnia, but also loses all of her siblings and parents to a single train accident and, one assumes, must now bear this grief alone in England? Where is Aslan’s compassion and forgiveness? Does he not recall that she wept alongside Lucy over his dead body upon the Stone Table before his resurrection? Or is there perhaps some other hidden answer, a consolation not directly written on the pages of the final book? Perhaps the most difficult aspect for me about the closing of The Chronicles is that because the world has come to an end we as readers cannot hold on to the glimmer of hope that we may find a doorway to that world as well. Fairy-story gives us faith in the real existence of the Imaginal Realm, and a trust that we too may some day be given the grace to enter its domain. 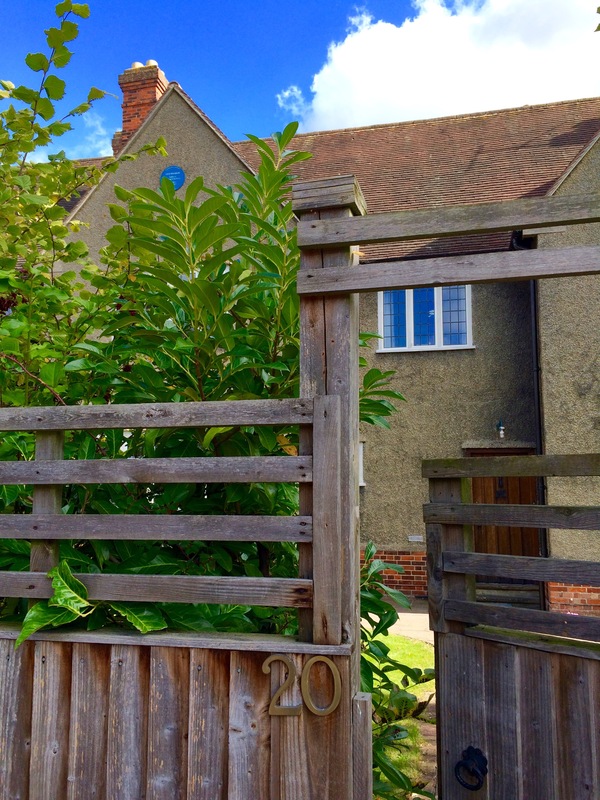 But what if “the gates should be shut and the keys be lost,” as Tolkien writes, and we are locked upon the outside? Whence then do we turn to enter into Faërie? Perhaps it is in this sense of loss and nostalgia that one can truly reflect upon the potency of Lewis’s stories, for though they do at times bear the flaws of an all-too-human author, do we not still wish to return to the woods of Lantern Waste, the palace of Cair Paravel, and the sweet waters and white lilies of the eastern Silver Sea? Perhaps we may yet be granted that wish, for the time of the Narnian world does not align linearly with the time of this world—and some new doorway may someday open, allowing a different epoch of Narnia to be explored by some fortuitous wandering soul. With the ending comes both nostalgia and hope, a sense of loss mingled with the potential for remembrance and rebirth. Lewis, C.S. The Chronicles of Narnia. New York, NY: Harper Trophy, 1994. Tolkien, J.R.R. “On Fairy-Stories.” In The Monsters and the Critics. Edited by Christopher Tolkien. London, England: HarperCollins Publishers, 2006. C.S. Lewis, The Last Battle: The Chronicles of Narnia, (New York, NY: Harper Trophy, 1994), 212. C.S. Lewis, The Lion, the Witch, and the Wardrobe: The Chronicles of Narnia, (New York, NY: Harper Trophy, 1994), 199. J.R.R. Tolkien, “On Fairy-Stories” in The Monsters and the Critics, ed. Christopher Tolkien (London, England: HarperCollins Publishers, 2006), 109. With these words J.R.R. Tolkien introduces his readers to Faërie, the domain of fairy-story, a realm encountered through Imagination. But what, one might ask, are fairy-stories? Often fairy-stories have been construed as short tales written for children, of little weight or importance in the world of adult matters. In five separate essays, this simplistic perspective is argued against by Tolkien, C.S. Lewis, George MacDonald, G.K. Chesterton, and Stephen Clark, who each wrote their own defense of the genre of fairy-story. From differing yet complementary perspectives, these five authors address what fairy-story is and why it is important, exploring the relationship between fantasy and reality, Truth and Imagination, and the laws of consistency and morality that allow an true imaginal world to come into being. We do not enjoy a story fully at the first reading. Not till the curiosity, the sheer narrative lust, has been given its sop and laid asleep, are we at leisure to savour the real beauties. Till then, it is like wasting great wine on a ravenous natural thirst which merely wants cold wetness. The children understand this well when they ask for the same story over and over again, and in the same words. At least it will be plain that in my opinion fairy-stories should not be specially associated with children. They are associated with them: naturally, because children are human and fairy-stories are a natural human taste. Tolkien goes on to say, “If fairy-story as a kind is worth reading at all it is worthy to be written for and read by adults.” The stories that affect us most as children are usually those we read again and again long into adulthood. Such stories shape who we are as individuals, allowing us as readers to fully inhabit the emotions, experiences, challenges, and breakthroughs of a multitude of people. Through story, and the inherent awakening of Imagination, we can bring more of ourselves forth into the world and develop more fully. To create a fairy-story worth reading, a successful fantasy, the creator must imbue it with what Tolkien calls an “inner consistency of reality,” a quality that is bestowed only by the power of Imagination. The successful storyteller “makes a Secondary World which your mind can enter. Inside it, what he relates is ‘true’: it accords with the laws of that world. You therefore believe it, while you are, as it were, inside.” MacDonald, as written in his essay “The Fantastic Imagination,” shares with Tolkien this perspective on internal consistency: “To be able to live a moment in an imagined world, we must see the laws of its existence obeyed.” Without such laws an imaginal world could not hold, it would fall apart into meaningless disconnection. For Tolkien and MacDonald, these internal laws, the ‘inner consistency of reality,’ are given by the power of Imagination. Imagination allows one to access to Truth, and Truth is what provides an imaginal world with its own reality. Law is the soil in which alone beauty will grow; beauty is the only stuff in which Truth can be clothed; and you may, if you will, call Imagination the tailor that cuts her garment to fit her, and Fancy his journeyman that puts the pieces of them together, or at most embroiders their button-holes. Both MacDonald and Tolkien reference the theory of Imagination articulated by S.T. Coleridge in his Biographia Literaria, which delineates the difference between the creative powers of the Primary and Secondary Imagination from the function of Fancy. The role of Fancy is to reassemble aggregates of remembered experience. Imagination, on the other hand, gives birth to new life: the Primary Imagination births the Primary World of creation, the Secondary Imagination births Secondary Worlds of human Art and creativity. The Primary and Secondary Imagination differ only in degree, and the Secondary Imagination is simply the Primary Imagination creating through the vessel of the human being. For this reason Tolkien refers to one who creates a Secondary World as a “sub-creator” because she or he is creating under the Primary Creator. Tolkien writes, “Fantasy remains a human right: we make in our measure and in our derivative mode, because we are made: and not only made, but made in the image and likeness of a Maker.” Human creativity is the gift of Divine creativity. Within the heart of Faërie, as understood by these authors, is also a consistent moral law that is more pronounced than the moral law of the Primary World. Chesterton writes in his essay “Fairy Tales”: “I think poets have made a mistake: because the world of the fairy-tales is a brighter and more varied world than ours, they have fancied it less moral; really it is brighter and more varied because it is more moral.” Indeed, the clear morality present in fairy-stories is a sign of their enchantment; when such connection is severed the world becomes disenchanted. Perhaps this is why, in a time when the dominant world view is largely disenchanted, fairy-stories are so alluring—even when the critics say that as adults we must put them aside. Fairy-stories allow access to Truth in a way that everyday lived experience may not. Tolkien points towards this when he writes, “The peculiar quality of the ‘joy’ in successful Fantasy can thus be explained as a sudden glimpse of the underlying reality or truth. It is not only a ‘consolation’ for the sorrow of this world; but a satisfaction, and an answer to that question, ‘Is it true?’” Shining through the fantastical narrative is that glimpse of Truth, which can be perceived more clearly through the fresh lens of fairy-story, rather than the clouded window of our ordinary, everyday perception. It is to take folk-stories seriously as accounts of the “dreamworld,” the realm of the conscious experience of which our “waking world” is only a province, to acknowledge and make real to ourselves the presence of spirits that enter our consciousness as moods of love or alienation, wild joy or anger. In W.B. Yeats’s philosophy fairies are the moods and characters of human life, conceived not as alterations in a material being, but as the spiritual rulers of an idealistically conceived world. Clark articulates the idea that to believe in fairies, or mermaids or dragons, or other inhabitants of Faërie, is not to reduce them to some facet of the known material world—such as insects, manatees, or other mistakenly glimpsed animals—but to accept as an essential part of these beings the very mystery of what they are. Tolkien writes that Elves, and other creatures of Faërie, are “true” “even if they are only creations of Man’s mind, ‘true’ only as reflecting in a particular way one of Man’s visions of Truth.” The beings of Faërie are born of Truth and mystery, and if we do not reduce them to mistaken perceptions of the physical world, or mere flights of Fancy, Truth and mystery comingle and give birth to something real. For Tolkien fairy-stories provide a “recovery” of the Primary World, “a regaining of a clear view.” Fantasy gives us the opportunity “to clean our windows; so that the things seen clearly may be freed from the drab blur of triteness and familiarity.” Returning from the pages of fantasy to one’s life, our mundane habits give way to the patterning of story. Imagination breathes new life into the simplest actions—once again we can recognize the miracle in good food, the laughter of a friend, the colors of the setting Sun. In Lewis’s words, “. . . the whole story, paradoxically enough, strengthens our relish for real life.” Yet Lewis seems to diverge from Tolkien when he says: “This excursion into the preposterous sends us back with renewed pleasure to the actual.” I do not feel Tolkien draws such a distinct line between the ‘preposterous’ and the ‘actual.’ Fantasy and reality for Tolkien cannot ultimately be separated. Only those who have lived out of water know what water is. 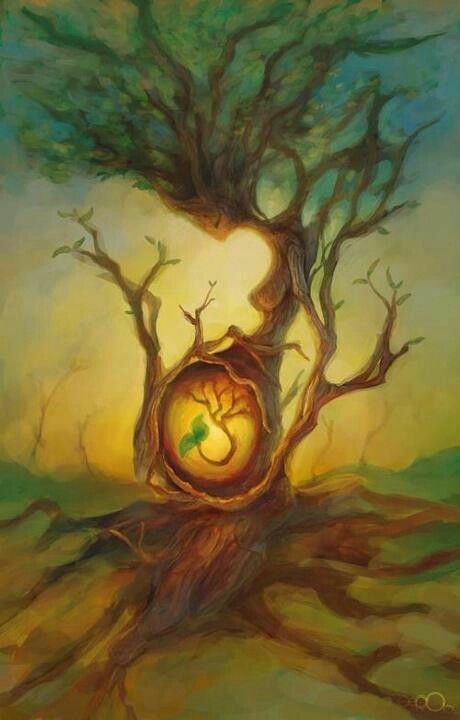 Only those whose ordinary human life is structured by ceremonial and human meaning, who know of their duties and their perils, their friends and children, can clearly conceive that form of life which is fairy. I would say that the experience of disenchantment, of seeing the world from a desperately practical perspective, is simply a forgetting of the enchantment inherent in our lived reality, the magic of the waking world. Such forgetting is its own form of enchantment. We are compelled, as Lewis felt, to return again and again to the great stories that affected our lives so deeply because some part of us knows we want to remember. We forget so that we may remember. “The primal desire at the heart of Faërie,” Tolkien writes, is “the realisation, independent of the conceiving mind, of imagined wonder.” We forget so that again and again we may return, through story and Imagination, to experience wonder once more. Chesterton, G.K. “Fairy Tales.” In G.K. Chesterton. New York, NY: Catholic Way Publishing, 2014. Clark, Stephen R.L. “How To Believe In Fairies,” Inquiry, 30:4: 337-355. MacDonald, George. “The Fantastic Imagination.” In A Dish of Orts, 232-237. Hazleton, PA: The Electronic Classics Series, 2012. Lewis, C.S. “On Stories.” In Of Other Worlds, 3-21. San Diego, CA: Harcourt, Inc, 1994. Christopher Tolkien. London, England: HarperCollins Publishers, 2006. C.S. Lewis, “On Stories,” in Of Other Worlds (San Diego, CA: Harcourt, Inc, 1994). George MacDonald, “The Fantastic Imagination,” in A Dish of Orts (Hazleton, PA: The Electronic Classics Series, 2012), 233. MacDonald, “The Fantastic Imagination,” 233. G.K. Chesterton, “Fairy Tales,” in G.K. Chesterton (New York, NY: Catholic Way Publishing, 2014). Stephen R.L. Clark, “How To Believe In Fairies,” Inquiry, 30:4: 337. Tolkien, “On Fairy-Stories,” 113, n. 2. Clark, “How To Believe In Fairies,” 349.